The Toreros' defense will try to stop a triple-option attack that finished 3rd in the FCS in average rushing yards last season. This Saturday, the defending Pioneer Football League co-champion Toreros will open the season on the road against Cal Poly for the second year straight. 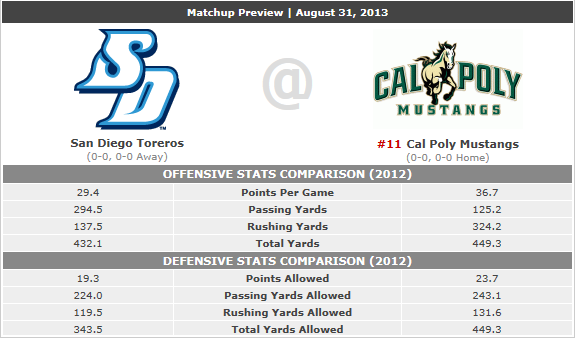 This will only be the third meeting between the teams with the Mustangs owning a 2-0 advantage in the series. In last season’s opener, the Mustangs rolled to a 41-14 win after putting up 21 unanswered points in the fourth quarter. 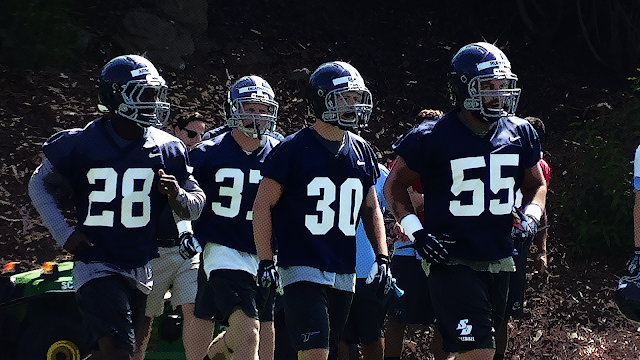 First year head coach Dale Lindsey hopes to lead the Toreros to a third consecutive PFL title and an automatic berth to the 2013 FCS playoffs. The former defensive coordinator returns 11 starters from last year’s squad that finished the season on a six-game win streak. The Mustangs enter the season ranked No. 11 in the NCAA Division I FCS preseason coaches’ poll and No. 14 in the TSN media poll. They will be led by their fifth year head coach Tim Walsh who returns 17 starters from last season’s 9-3 campaign where they captured a share of the Big Sky title in their first year as conference members.